The Dominican Republic is located in Central America in the Caribean in between Cuba and Puerto Rico. The Island Hispaniola , as Christopher Columbus has baptist the island, today it constitute of two states : Haiti to the west and the Dominican Republic which occupies two thirds of the island to the east . The geography of the Dominican Republic offers a diversity of landscapes, thanks to its 1000 Miles of Palm coast lines (which includes 400 Miles of beaches), its deserted regions are over grown with catuses, its agriculture fields are to the center of the island, also the highest mountain of the Caribbean is located here the Pico Duarte which is 3087 meters high! You can also find a salt water lake Lago Enriquillo which is 45 meters below sea level, there you can find a variety of iguana species, flamingos and some of the last American crocodiles. The climate in the Dominican Republic is Tropical with a high humidity. The north-west wind makes it pleasent again, you can feel a slight variation during the year with only 2 seasons winter and summer. The medium temperature is around 25° (77°), it can get as low as 62°F in very cold winter nights, during the summer it can get as high as 104°F but here in the Dominican republic you'll suffer less then with the dry heat in Europe for example. 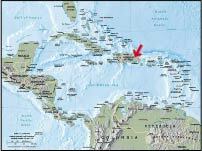 To know the Weekly Forecast You can clic on the link "weather", there you can also find a satelite map of the Caribbean. It is not that easy to difference the two seasons of the year because the climate hardly changes. That's why it is possible to arrange your vacation in the Dominican Republic trough out the year and enjoy the beaches and the climate. There is alltough a more refreshing season during November until April (with more rain showers in December), and the rest of the year it is hot with some rain. The rain showers are mostly during the night time which is very pleasant during the summer because it cools down, their are some very heavy rain showers (tropical rain showers) but they don't last that long. The hurricane Season is during June until November. The hurricanes don't strike the island that often but they can be very devastating like George in 1998 or Jeanne in 2004. The official language of the Dominican Republic is Spanish, in the more touristic cities you'll also find English. the Hatiens are the mayor group of foreigners which speak French "créole". the Dominican political system is very stable republic. The presidential elections are every four years. The constitution envisages a division of the capacities, legislature, executive and legal. The congress is composed of the senate and the House of Commons. The religion is always present in the lives of the Dominicans. The mos dominant religion is Catholic Romano, nearly 98% of the Dominican population are Christians. The Dominican are of an accessible nature and like to find themselves for drinking and dancing by listening to the typical musics like the bachata or the mérengue. e.
The Dominican Republic has taken knowledge the importance of natures protection, today more than 20% of the country has been set to be a natural reserve. You can look at many national parks like Jaragua, los Haïtises, la Caleta, la Sierra de Baoruco, el Morro, Montecristi and the park del este. All of these parks and natural reserves have a total surface of more than 10000 km² and they are controlled by the military. A variety of excursions to these parks exist but for some visitations you'll need an authorisation. National Park "Armando Bermudez and Nacional José"
National Park "Loma Isabel de Torres"
National Park "Cuevas de Bourbon o de El Pomier"
Historic Park "La Vega Vieja"